The table below gives the soil test values for selected treatments in 1996 and again prior to sowing the 2011 crop. 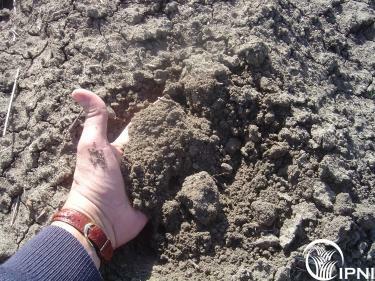 Mineral N levels of the lower N application rates for the topsoil are similar for the two samplings, and soil organic N and C contents have not altered significantly over those 16 years. Soil C levels significantly increased with added P at all N levels, but did not decline with added N in contrast to the report by Khan et al. (2007) from the long term “Morrow” plots in the United States of America. Gove et al. (2009) suggest that the results from the Morrow plots are confounded by the use of inappropriate controls. Colwell P levels increased with added P but were not affected by added N, and the total P in the top 10 cm increased by approximately 0.0007% for each kg P/ha/y over the duration of the experiment (Table 3). This equates to an additional 58 kg P in the top 10 cm compared with the nil P treatments. Because P stimulated legume growth and so the total amount of nitrogen fixed, the added P could have resulted in higher soil N and C levels, because of this increased N and C input. The soil phosphorus buffering capacity was 115 indicating a relatively low soil P demand. Why does P increase OM while N does not add much? Soil is more P limited than N limited – the effect of P is to increase legume growth and N fixation – these are some measurements made in 2005 on the lentil crop, showing that the amount of N fixed increased with applied P, but that the amount fixed in kg per t of dry matter grown, was not increased. So the effect of P is to increase the amount of growth and therefore N fixation, rather that improved N fixation alone. What about soil pH - did it change? It is well known that the nitrification of ammonium to nitrate and then subsequent leaching of the (mobile) nitrate down the profile causes acidification in the top soil. This is expect to occur in the highest N treatments where the most ammonium is present and then nitrified. This is pretty much what happened at Dahlen. The changes are relatively small (less than 0.8 pH units), but the soil is strongly buffered (a clay) and the lower (20-40 N) were probably all pretty much used in the topsoil so that little leaching was likely. The application of P did not affect soil pH in this experiment.